A mob of about 300 people a a U.N.-guarded refugee camp in Ivory Coast near the town of Duekoue in the country’s west, killing at least seven of the refugees and 67 others injured. The Nahibly camp used to house some 4,500 people. The camp completely burned to the ground, and its 4,500 inhabitants fled. Today, the United Nations human rights agency has expressed condemnation on the attack that took place on a relocation camp for internally displaced persons (IDPs) in Cote d’Ivoire. Pictured are displaced Ivorians in Duekoue, in the western MoyenCavally region of Cote d’Ivoire. The area has been plunged into crisis since fighting erupted between military forces loyal to former Ivorian President Laurent Gbagbo and supporters of the internationally-recognized new president, Alassane Ouattara. The Office for the High Commissioner for Human Rights (OHCHR) has stressed that the ethnically-motivated incident underscores the need to combat impunity for past abuses. A UN investigation team, including human rights officers, is being dispatched to the area today for a 10-day mission, according (OHCHR). Mr. Colville noted that at the height of the post-electoral crisis in March 2011, two massacres took place in the Duekoue-Guiglo area. Mr. Colville stressed that it appears that the attack on the IDP camp in Nahibly was targeted at members of the Guere community, which is being blamed by the Dioula community for an armed robbery last week. He added that more than a year after the March 2011 Duekoue ethnic violence, little progress has been made in advancing justice and accountability. He noted that while more than 176 members of the pro-Gbagbo camp, aligned with former President Laurent Gbagbo, have been indicted for violations committed during the post-electoral crisis, no arrests have been made of supporters of current President Alassane Ouattara in relation to these crimes. OHCHR encourages the Government to prosecute perpetrators from all sides of the political divide, through a fair and impartial judicial process, to take the country forward. 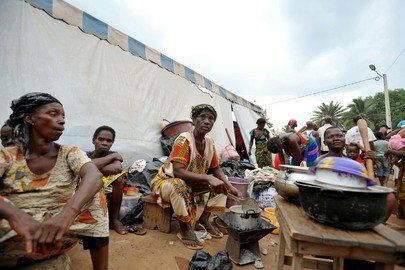 Earlier this June, the United Nations refugee agency said as the situation stabilizes in Cote d’Ivoire, the pace of the Ivorian outflow into neighbouring countries is gradually slowing.